Today marks the 365th day of the year. You know what the means – it’s time to turn over a new leaf and find ways to improve yourself in the year ahead. Yes, we are talking about New Year’s Resolutions. Past the first week, 75 percent of resolution-makers are still going strong. Past two weeks, the number drops slightly to 71 percent. After one month, resolutions kept drops again to 64 percent. Finally, after six months, only 46 percent of the original resolutions are maintained. Those who write down their goals on a piece of paper are much more likely to succeed versus those who do not. Why? Because writing down your goal forces you to brainstorm an action plan and motivate you to take action. Learn more about the advantages of committing your goals to writing. The New Year inspires us all to want to make big changes. Self-improvement is always great; however, deciding to change too many bad habits at once can be overwhelming. If you resolve to stop smoking, start exercising and eat healthier, you are putting a lot of pressure on yourself. Instead, decide to focus on one resolution and work up to the others. Resolutions are always challenging, but they are even more difficult when all you have is a large and seemingly impossible goal. Saying, “This year, I want to give more to my favorite charity” could mean writing a large check next December or it could mean making small donations throughout the year. Yes, you will accomplish the same objective, but which one are you more likely to notice? Did you know that giving to Lions Pride is simpler than you can imagine? Many Pride supporters choose to simplify their giving by automating their monthly gift. Find out how you can automate your donation. Remember that all improvements start with a decision to make a change. Make 2016 the year that you change your life for the better. We know you can do it! There’s no question that 2015 was a spectacular year, but we’re ready to see what the New Year has in store for us. The Lions Pride office will be closed for the remainder of the week. Have a safe and enjoyable New Year’s Eve. See in 2016! As a child, do you remember the magic you used to feel on Christmas Eve? The excitement you felt as you left out cookies and milk and got ready for bed? Then spending the night watching the clock because you just couldn’t wait for the morning? Sadly, as adults, the magic of the season seems to disappear a little more each year. Santa no longer represents a symbol of joy and Christmas celebrations just seem like another family get-together. Fortunately, that magic does reappear as we have children of our own. Suddenly, our role changes from excited child to excited parent. We spend the night also making preparations and we, too, await Christmas morning so we can watch our kids eagerly open their gifts. We experience a different kind of magic – the magic of giving. At Lions Pride, we feel so lucky to be in a special kind of role. Although our kids may be grown, we still get to play the role of Santa throughout the year. Each summer, we are able to give special children the gift of experience at Wisconsin Lions Camp. In 2015, over 140 children were given the opportunity to have the week of their lives out in the woods – camping, roasting marshmallows, swimming and enjoying everything nature had to offer. None of this would be possible without the help of you, our donors and supporters. We’ve said it once and we’ll say it again, thank you for all that you do support the Lions Pride Endowment Fund! We could never accomplish our mission to preserve, protect and provide for Lions Camp and all WLF statewide projects without you. Today is 12-12, hence the subject of today’s Blog, the 12 Days of Christmas. As we all know, the Christmas season has gone through some drastic changes over the last decade. This year, stores were selling Christmas decorations before Halloween, we began hearing the sounds of Christmas on the radio in early November, began shopping on Thanksgiving Day and as far as most of us are concerned it will be all over on December 26th. So during this two month timeframe, when do the 12 days of Christmas arrive? Surprisingly, 12 days of Christmas begin on December 25 and have very little to do with jewelry, farm animals, musicians and stable hands. There is actually a quite deeper meaning. The partridge in a pear tree was Jesus. The four calling birds symbolized the four gospels of Matthew, Mark, Luke and John. The five golden rings stood for the Torah or the first five books of the Old Testament. The six geese of laying represented the six days of creation. The seven swans-a-swimming stood for the sevenfold gifts of the Holy Spirit. The eight maids-a-milking symbolized the eight beatitudes. The ten lords-a-leaping stood for the Ten Commandments. The eleven pipers piping represented the eleven faithful disciples. The twelve drummers drumming symbolized the twelve points of the Apostle’s Creed. By celebrating the 12 days of Christmas from Christmas Day to January 6, we are able to reflect on the true reason for the season. our blessings and share the peace and love of the season with others throughout 2014. 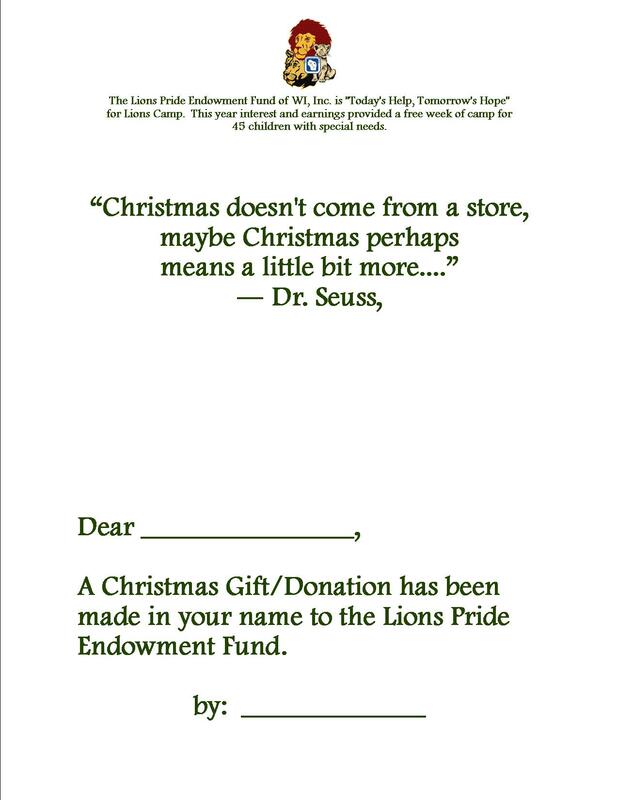 Remember, for those on your list that are hard to buy for, make a donation in their honor to Lions Pride, before December 19th, we will send a personalized Christmas Card to notify them of your gift. Click here to make your online donation and just enter the recipient’s address in the comments box or mail in your donation and include a note with their address. How will you keep the spirit of Christmas alive in 2014? Tell us in the comments below or share with us on Facebook with #LPEF. It is December, which means the season of giving is officially upon us. Do you have anyone on your Christmas list that is difficult to buy for or say they don’t need or want a gift? The perfect alternative is a donation to Lions Pride. Your family and friends will be more aware of our cause and perhaps will consider giving their own donation. This is a great indirect way to let your family, friends and business associates know about Lions Pride. Make a donation to Lions Pride in their name and we will send a personalized Christmas Card to notify them of your gift. 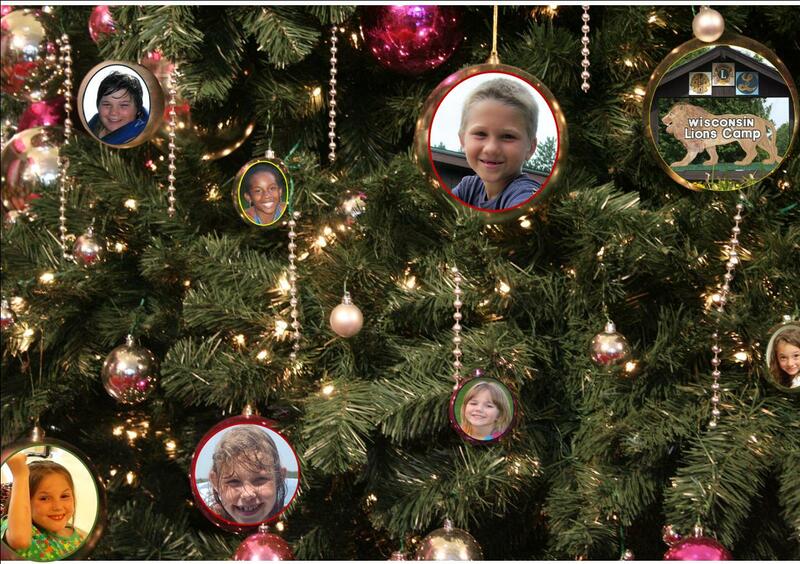 If the donation is received on-line or in our office December 19th, they will receive the card before Christmas. Click here to make your online donation and just enter the recipient’s address in the comments box or mail in your donation and include a note with their address. Also, as this year draws to a close, surrounded by family and friends, reflecting on your blessings, if you haven’t already considered it, this may be the time to start thinking about planned giving. Planned giving occurs when gifts are made using other property that has increased in value such as: gifts by will, Charitable Remainder Annuity Trust (CRAT), Charitable Remainder Unitrust (CRUT), Charitable Lead Trust, life insurance plans and retirement plans. By planning your giving, you can avoid potential tax issues to your heirs down the road. For instance, if you have both a life insurance policy and an individual retirement account (IRA,) you may want to consider gifting your IRA to the Lions Pride Endowment Fund of WI, and your life insurance to your heirs. The IRA would be tax-free to Lions Pride, but taxable to your heirs. Consult with your personal financial planner and when considering your plan we hope you consider including the Lions Pride Endowment Fund of WI, Inc. Remember, in supporting the Lions Pride Endowment Fund you are ensuring and preserving the legacy for the Wisconsin Lions Foundation and the Lions Camp. To learn more about planned giving, please visit our informational webpage and be sure to contact us with any questions you may have along the way.